The best children's martial arts training program! Captivating and fun. Teaching Saito Ninjitsu together with Karate, Jujitsu, Aikido, and Life Skills with a focus on FUN. Give your child the confidence and skills that will influence positive behaviors and attitudes in school and at home! Master Maui's training is strategically different. 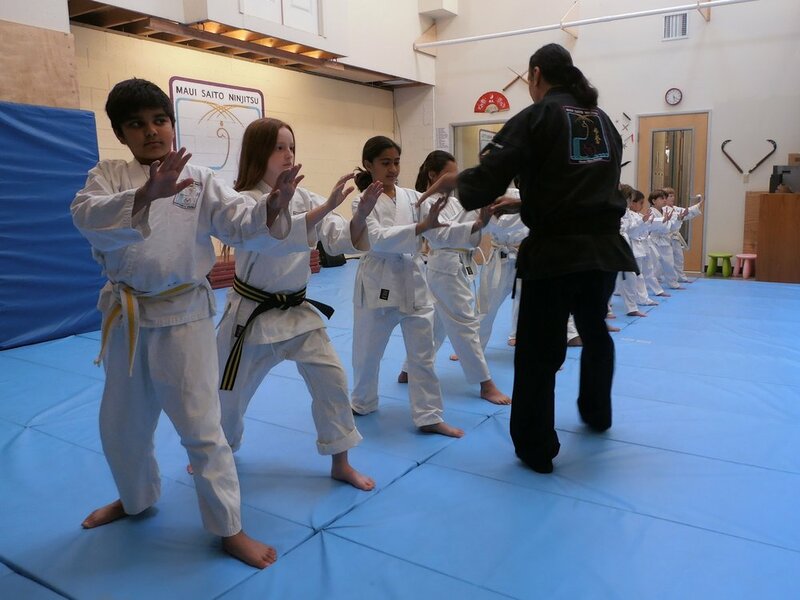 He provides an atmosphere of fun and fitness that uses a child's innate desire to play as a way of teaching the skills needed for martial arts, ensuring they will excel. A method that provides a much stronger retention of skills than other forms of teaching martial arts. Children love his classes and continue for years enthusiastically. We believe the best way for a child to learn is from the inside out, not the outside in. Therefore, although our students learn discipline, we are not militant. As we all know, children are like sponges, the right input will develop a strong character. Here, we teach more than learning to block, kick and punch. The comprehensiveness of the martial arts are simplified to the root essence of the technique or skill and then translated into martial art games that are better absorbed by children. The games either directly teach a defensive strategy for a threatening situation or set up the correct physical self-defensive response. Our students love our classes, and never tire of learning! "My child would not change this class for anything!!! Now my whole family is taking Master Maui Ninjitsu classes and we are looking forward to get our black belts one day!!" - Nathalia H C.
You will see Master Maui teaching the Kids Classes himself with rare exception. He is very much loved by his students, and takes the time and attention for individual personality and the different needs of each child, bringing out their best... giving them each a little one-on-one attention. He has been teaching kids his entire adult life. Saito Ninjitsu together with Karate, Jujitsu, Aikido, and Life Skills are taught. The curriculum is comprehensive, intuitive, accommodates variation, and instills confidence, athleticism, discipline, increased attention span, critical thinking, patience, focus, kindness, responsibility, and strong core values - all while having fun. We are more than a school, we are a family! "Master Maui teaches them unique skills that would help them if ever caught in a bad situation. The kids are having so much fun that they don't even realize they are getting a valuable lesson." -Scott G.
Ninja Kids Cubs start with basic mat-work skills and a lot of different exercises to find their centers and gain balance and control over their new growing bodies. Intuitive learning is the key - Your child’s ability to learn from the inside-out. A lot of coordination and confidence building are implemented in this class of super hero’s. Specially designed games and martial arts gymnastics enhance fitness, coordination, and self-confidence, as well as real world skills that will help to ensure their safety and protection. We believe this is the best way for kids to learn. Our focus is development of their natural internal survival skills, and creating a positive behavior pattern. They learn self-discipline, awareness, and all kinds of fun ninja skills, and even quiet mediation – And they love it! Students quickly build their self-esteem and feel great about their achievements. "My 4 year old absolutely loves Ninjitsu and Master Maui!! He is learning skills like balance, coordination as well as patience and respect. Every class is unique and jammed packed with fun things like swinging on a rope to using pool noodles as swords!! We are excited for summer camp to start soon!!" Ninja Kids Tigers intuitively learn at a higher level. At this age they start to be challenged more. Students learn how to out maneuver their opponents. Learning progresses through the belt rankings and through the classes as maturity increases, bringing more focus on safety and protection techniques that are age appropriate. "Master Maui has made learning skills into a game that ALL kids enjoy. I am so glad we found him. We drive from Paradise Valley up to his studio. I think we pass all 5 of the other studios to get there but it’s worth every minute." In addition to Saito Ninjitsu training kids learn many martial arts skills including Japanese Jujitsu techniques. Increased training on self-defense skills such as learning good wrist escapes and various techniques of personal protection that continue to be perfected and set the complete basic ground work for when the Ninja Tiger Warriors move into Teen/Adult classes. Kids are vulnerable, of course, and self-defense, awareness, identifying danger, and what to do if/when they do encounter trouble, helps to ensure their safety and protection. Our program comprehensive and taught in such a way that kids desire and continue to learn real world skills. Sensei Daron is one of Master Maui Saito's long time top black belt students. He occasionally fills in for kids classes if Master Maui is ever away. He is adored by his students - exuberant, dedicated, and fun to be around. An Australian thru and thru, and a superior instructor whose teaching abilities are often complimented on. "My son LOVES it! It is very challenging but they are having so much fun! Master Maui and Master Daron are phenomenal with kids. "- Barbara C.
And Learning how really fun Saito Ninjitsu is! Thierry Brotherton in the photos above teaching with her dad. She is a Ninja Kids Camp Counselor and occasionally helps with kids classes when needed. The kids love her too!